Led by experienced archer and archery instructor Diane Minion, our archery program is for beginners through advanced archers. Archers work with a volunteer guide from Heights Archery, and use tactile cues (tripods for arm positioning and foot guides) to position themselves, and receive verbal assistance and coaching from their guide. For an audible cue, balloons can optionally be placed on the target to provide the archer an audible cue when they have hit a specific point on their target. 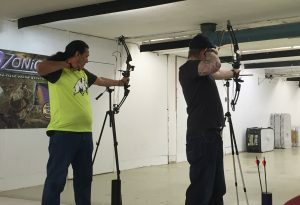 Offering several ten-week sessions throughout the year in partnership with Heights Archery, MBSA’s blind archery program is open to athletes ages 10 and older, and runs from 5:30 to 6:30 pm on Thursdays at Heights Archery (2281 Portage Avenue). Diane Minion started coaching archery in 1986. She teaches mainly grassroots archery classes, and started teaching my blind and visually impaired archers in 2014.